[March 28, 2018 update] Be on the lookout for notebooks shipping with the MX150 'N17S-LG-A1' or '1D12' variant as GPU performance can be 20 to 25 percent slower than a "standard" MX150. The '1D12' label is essentially the Max-Q version of the MX150 and Nvidia has not been explicitly distinguishing between the two distinct MX150 versions in any of its promotional material thus far. (March 28, 2018 update: Xiaomi uses the slower MX150 GPU for the Mi Notebook Air and the Mi Notebook Pro, but the latter is equipped with a higher clocked version). TL;DR: We've discovered two distinct versions of the GeForce MX150 with wide performance differences and power demands. The second version is notably slower and less demanding than the "standard" MX150 with underclocked clock rates, Boost rates, and VRAM not unlike a Max-Q GPU. 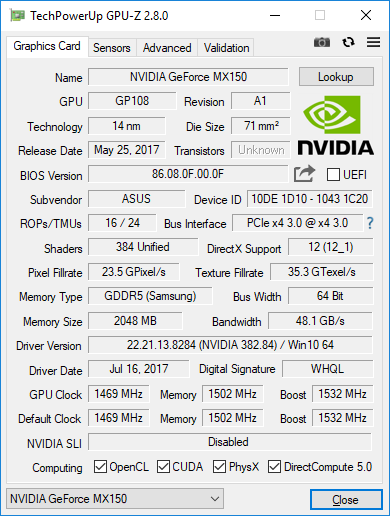 This slower "MX150 Max-Q" can only be found on 13-inch Ultrabooks so far. 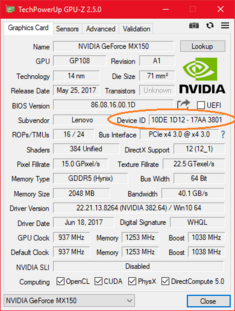 We recommend being cautious if purchasing a notebook with the MX150 GPU as neither Nvidia nor the manufacturers have been explicitly advertising the slower GPU version. Please see our dedicated page on the GeForce MX150 for more technical information on the two versions of the GPU. When the GeForce MX150 was announced early last year, our initial tests and sources pointed to a 25 W TDP to be in line with the outgoing GeForce 940MX that the new Pascal GPU directly replaces. 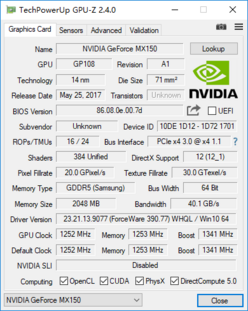 Nvidia never explicitly mentioned, however, that there would be two distinct versions of the MX150 beyond the simple VRAM differences that we've become accustomed to in the past. Our first laptop with the MX150 was the MSI PL62 and it was there where we recorded core clock, Boost clock, and VRAM speeds of 1469 MHz, 1532 MHz, and 1502 MHz, respectively. Curiously, a select few notebooks have also been shipping with underclocked MX150 GPUs rated for significantly slower clock rates across the board. 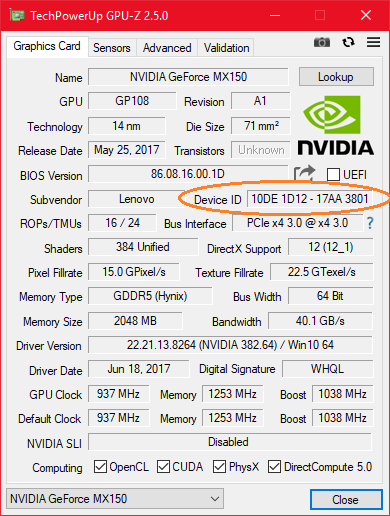 Our two GPU-Z screenshots below compare the Asus Zenbook UX430UN and Lenovo IdeaPad 320S each equipped with the same MX150 GPU by name but with very different clock rates. Xiaomi also uses the low power version of the MX150 GPU in its Mi Notebook Air and Mi Notebook Pro laptops. Both are equipped with the slower 1D12 version, but it seems the larger Mi Notebook Pro has more thermal headroom so Xiaomi increases the clocks of the GPU. Both the clock and the performance are almost right in the middle between the other two models. 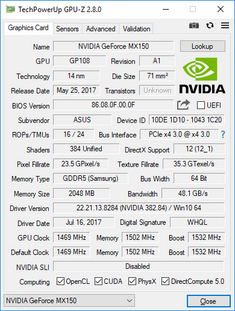 Asus Zenbook UX430UN with "standard" '1D10' 'N17S-G1-A1' GeForce MX150. Xiaomi Mi Notebook Pro with the slower 1D12 version, but higher clocks. The base clock rate alone is 36 percent slower on the '1D12' variant of the MX150 when compared to the initial '1D10' model that the MX150 debuted with. This is not limited to the IdeaPad 320S either, as we've spotted the same MX150 '1D12' variant on a handful of notebooks including the ZenBook 13 UX331UN, Xiaomi Mi Notebook Air 13.3, HP Envy 13, and the ZenBook UX331UA thus far. Raw graphics performance is unsurprisingly faster on notebooks with the '1D10' variant of the MX150. Our 3DMark 11 chart below compares all notebooks in our database equipped with either the '1D10' or '1D12' variant of the MX150 and nearly all models with the slower '1D12' variant are conveniently on the bottom of the list. The ZenBook UX430UN sits comfortably in the center of the chart since its '1D10' GPU regularly throttles as detailed in our review, but users can generally expect a significant performance drop of about 20 to 25 percent between the two versions of the MX150. Why have two variants of the MX150 in the first place? 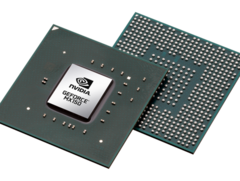 The reasons are likely related to power management as the slower '1D12' GPU is purportedly within a 10 W TDP envelope for thinner and lighter notebook designs similar in concept to the Max-Q series of GTX GPUs. We've noticed, for example, that nearly all notebooks thus far with the '1D12' version of the GPU are 13-inch notebooks. While we don't have an issue with selling multiple variants of the same silicon, it's disappointing to not see any marketing material differentiating between the two versions especially since their performance deltas are more than marginal. Casual gamers or heavy users looking for full performance out of the MX150 should double-check new notebooks before committing to a full purchase.